With king XL bed, or 2 single beds. Bathroom with bath and shower, room first floor. Own private balcony. Kettle, coffee pod, fridge, fully air-conditioned, cable TV, safe for valuables, free Wi-Fi. 1 Bedroom with XL queen bed, bathroom with shower, fully air-conditioned. Private garden entrance. Access to bar fridge, free Wi-Fi, Cable TV. If cancelling 30 days before arrival, forfeit 100% of the booking total. * Check In: from 15H00 until 20H00 * Check Out: 10H00 * Late arrivals and check outs to be arranged with reception. * Smoking designated to outside areas. * No pets. * No Children under 15 years * Swimming pool & Jacuzzi used at own risk. Towels provided. Conditions Please note that Balance is due on arrival. We do not refund if you leave prior to your departure date due to weather or any personal circumstances. I understand that on check-in, my ID/passport must be shown & credit card details provided as security for any damages, breakages or lost key. 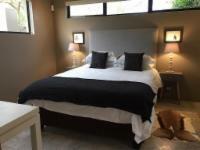 SELF CATERING ONLY: A R3000 deposit is required. This will be refunded after inspection of the premises, within 24 hours. Please note that for December/January reservations in self-catering GAPA House Hermanus, balance is due 21 days prior to arrival, cancellations made after this date will result in forfeit of the total amount paid. Please check your insurance covers you have for cancellations if necessary. ALL CHECK-INS ARE with meet & greet responsable. Check in is from 2.00pm. Apartments are not ready before this time.